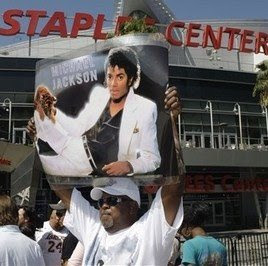 At least 50,000 people showed up Tuesday at the late pop singer Michael Jackson's memorial service held at the Los Angeles Staples Center. However, only 17,000 people with tickets would be allowed to attend the said event. The Los Angeles Police Department (LAPD) has warned that those who couldn't show any ticket and the access wristband at all will be barred from gaining entry at the memorial service. At this time, LAPD has already barricaded the Olympic Blvd., Flower Street, and Pico Street surrounding the Staples Center where the King of Pop's memorial service will take place. However, thousands of fans have expressed interest to attend the memorial service, despite the LAPD's warning. Many of them have come from far away places to pay their last respect to their singing idol who passed away 12 days ago by amassing around the Staples Center. At the same time, almost all media entities around the world have already positioned themselves close to the Staples Center. Besides, the LAPD has expressed apprehensions that the memorial day will cause some problems like traffic jams, security and cleanliness around the area. In fact, the LA city government estimated it would cost the city close to $4 million for the one day event alone. Meanwhile, Rep. Peter King today in a MSNBC interview criticized the ample media coverage being accorded to the late pop star, saying that he was a child molester and should not be given such a kind of publicity. Early this evening, the King of pops coffin was brought to the Forrest Lawn Memorial Park in San Fernando Valley for viewing. The event was closely guarded by the police so that only family members, relatives and close friends, including some celebrities, were allowed entry. While some of the fans and the paparazzi were cordoned off outside the memorial park.